We have been following Janice Dickinson through her breast cancer diagnosis and treatment. Ms. Dickinson has been more than open about her silicone breast implants. Thus, we have discussed difficulties in patients with implants regarding diagnosis and surgical treatment. We last checked in with Janice after she was diagnosed and had a lumpectomy and as she was starting radiation therapy. She has likely finished this, although there has been nothing in news r eports. She is probably experiencing skin changes from the treatment and mild fatigue. Long term she can expect mild tanning of her skin and some shrinkage of her breast. If she has prior capsular contraction, this could be exacerbated. 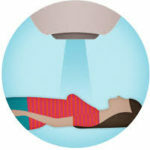 For the radiation therapist treating a patient with implants, the problems are not as complicated as they are for the radiologist or the surgeon. Treatment planning is somewhat more difficult, but the problems are easily overcome. Janice’s treatment will not end with the radiation therapy. If her cancer’s receptors are positive, she will meet with a medical oncologist to consider Tamoxifen or an aromatase inhibitor to reduce other cancers from developing. She will be followed closely radiologically on both sides. We can’t leave this discussion without addressing whether silicone implants increase the risk of developing breast cancer and how responsible they may be for autoimmune disorders or fibromyalgia. The use of silicone implants was halted by the FDA to study the matter. That ban was lifted after an extensive review. Silicone breast implants are not implicated in the development of breast cancer. Janice Dickinson’s cancer did not develop because of the implants. Nor are they clearly the cause of autoimmune disorders or fibromyalgia. This is not to suggest that implants are without complications. But most of the complications are surgical or aesthetic. We are going to leave Janice Dickinson for now and wish her well in the future. Hopefully, she will continue in her own unique way to bring public attention to breast cancer detection and treatment. I have no doubt that she will find a way to let us know if she has anything interesting to add….